Take a look at the following chart on Detroit’s population growth since 1840. The golden age of the U.S. car manufacturing industry (1930-1980) maintained Detroit’s population consistently above 1.5 million. However, the world is not a still photo, trapped in time forever. It is a moving picture and continually changing. Over a 50-year period, there were a number of significant changes — higher oil prices; higher wage demands; increased competition from Japan; and growing demand for smaller, fuel-efficient cars. As these factors began to bite from 1980 onward, Detroit’s population went into decline. It has taken 30 years for this exodus to bankrupt the city. Government largesse (promises of private pensions, etc.) reign supreme during the good times. Everyone wants a share of the spoils. The promises can be made and kept provided the pyramid of society A) remains roughly the same size and B) remains a pyramid — larger base, smaller apex. This is Detroit’s problem — the promises made in the boom times cannot be funded in the bust. There are simply not enough people left to extract sufficient tax revenues from. Detroit is a slightly extreme example of the demographic issues confronting the rest of the developed world. For the past 60 years — again, a sufficiently long enough time for two or more generations to become conditioned to thinking it will always be this way — the baby boom generation has been making its imprint on the global economy. One-third of past economic growth is directly attributable to the spending habits of a never-to-be-repeated generation — the baby boomers. Yet 60 years of conditioning has governments (erroneously) predicating their spending commitments (namely, welfare entitlements) based on the resumption of 3% growth. Guess what happens when a tail wind turns around? You guessed it — a head wind. According to the paper released by Rob Arnott and Denis Chaves titled “Mind the (Expectations) Gap: Demographic Trends and GDP” the economic head wind created by retiring baby boomers will detract 1% per annum growth from the economy. So if 2% is really the norm for economic growth, subtract 1% for the coming head wind and the “new normal” is going to be 1% economic growth. This is certain to blow a huge hole in government budgets. Our very own Treasury has shown in recent years how bad the actual deficit numbers are compared to their rose-colored projections. At present, we have central bankers desperately trying to stoke the economic fires to generate the bygone days of 3% growth. Memo to Bernanke: Not going to happen, Ben. The following chart from Arnott and Chaves paper forecasts a steady decline in GDP growth for the next 30-40 years. The baby boom generation is an abnormality. It was the byproduct of halcyon days — not that we knew it at the time. But as we have seen in Detroit, when demographics shift from production to pension, there is trouble ahead. Low birth rates combined with a plethora of maturing adults on the cusp of retirement turns the pyramid of society on its head. Wave after wave of boomers shifting from productive, taxpaying employment to pension-receiving retirement is only part of the equation (problem). The second part is increased life expectancies, meaning baby boomer retirees are going to tap the public purse for much longer and in greater numbers than any previous generation. Lower growth in itself is not a bad thing. We are still moving forward. The problem is certain promises (welfare and health commitments) have been made that cannot be kept if growth does not return to around the 3% mark. The squeeze is already on. Hardly a day goes by when there isn’t a story about lengthening hospital waiting lists or a new drug needing to be placed on the Pharmaceutical Benefits Scheme. Don’t get me wrong; these stories are about genuine people with real health concerns. The point I am making is what Arnott and Chaves call “the expectation gap.” Due to the shifting tectonic plates of demography, the gap between what the public expects and what governments can deliver is destined to become wider. Sixty years of continued prosperity have certainly altered society’s expectations. Putting this genie back in the bottle is going to be a political nightmare. Initially, the political class (as we have seen) will continue spending in the vain hope of a return to the good old days. This pretend-and-extend charade can last for only so long before the structural issues of overpromising and underfunding are addressed. Unfortunately, the political class (as we have seen in Greece, Ireland, et al.) acts only once the bleeding is obvious and stares them in the face. In the interim, politicians will continue to keep their heads in the sand, and debt-funded entitlement spending will be the order of the day. Sadly, higher deficits and public debt levels mean higher taxes on the next generation (my children). Gens X and Y can only be whipped for so long before they will decide enough is enough. And then the principle of “If something cannot continue, then it will not continue” will apply. It is incumbent upon those nearing or in retirement to recognize this demographic time bomb before it is too late. A popular acronym among retirees is SKI — “spend kids’ inheritance.” My advice for those taking this message to heart is to be careful, because you may live long enough to end up on SKId Road. Protect yourself now with prudent asset management and a carefully considered investment strategy based on conservative projections. 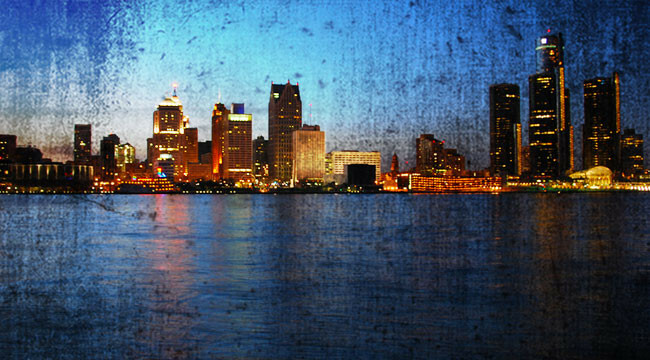 Detroit is an example of what happens when the time bomb of demographics and debt detonates. Vern Gowdie has been involved in financial planning since 1986. In 1999, Personal Investor magazine ranked Vern as one of Australia’s Top 50 financial planners. His previous firm, Gowdie Financial Planning, was recognized in 2004, 2005, 2006 & 2007, by Independent Financial Adviser (IFA) magazine as one of the top 5 financial planning firms in Australia. He is currently an editor for Port Phillip Publishing.